The simplest explanation is that a child “tells back,” in his own words, something that he has read, or that has been read aloud to him. It is, on the surface, such a very simple idea that it is not immediately apparent how much mental activity is involved. It is certainly not apparent how the continual use of narration will build language skills and lay the foundation for higher-level thinking and writing. Nevertheless, this simple technique contains the seeds that will make use of the wonderful abilities of the human mind, disciplining and sharpening them, so that the young adult who has years and years of narrations behind him will be exceptionally well-equipped for mental effort, challenge, and communication. In the beginning, narration is the tool whereby we train and develop our children’s attention. They already have the ability to give their full attention to something, but when narrations are required, they must exercise that ability purposefully. A child who allows his mind to wander during a reading, so that he is unable to narrate, should be reminded that he must “pay attention” or “listen carefully” in the future, lest he miss something. If this is a chronic problem, it is not a bad idea to let a child feel that he has indeed missed something important, in order to impress on him his responsibility to give his attention to a reading. Charlotte Mason brings a tremendous amount of experience and thought to this question. Her first principle, that children are persons, implies that they “are therefore moved by the same springs of conduct as their elders.” One of those “springs” is the desire to know, in evidence among us from Adam and Eve to the most recent newborn baby. This desire to know is enough motivation to encourage children to listen or read for knowledge, but the imperative of narration requires their attention to be focused and steady. Do not be deceived by the superficial simplicity of this method! When you read a story, paragraph, or chapter to a child and ask him to narrate what he has heard, powerful mental “wheels” must spring into motion. The knowledge that he has passively gathered must now be sifted and sorted. His mind must recall the beginning, and then “what comes next,” event by event. He must be sure the order of his knowledge is correct, and that nothing important is omitted. Then, he must find words to give shape to his knowledge. It is not uncommon for children to imitate the vocabulary and style of the author himself. Nevertheless, by using the words to tell “his” version of the story, he makes them his own. All this mental sorting, selecting, and ordering happens fairly quickly. The narration a child gives, whether it be a detailed account or a brief summary of facts, indicates that this mental process has taken place. Charlotte Mason suggested demonstrating this by trying to do it yourself. Read a chapter in a book, a newspaper article, or an essay, then “tell” the story back to yourself, point by point. You may find it much harder than you think, but you will gain some insight into the mental effort your children must make to narrate daily. Now imagine how this type of mental activity, engaged in day after day, week upon week, will strengthen your children’s minds! As they become accustomed to giving their full attention to a reading and afterward relating their new knowledge, they will gain the ability to sustain their attention for longer periods. They will use their growing vocabulary to be ever more precise in their narrations. They will be able to recall material that they have read and narrated many months before. It is the work of years, but they will reach a point in which the “tell the story in your own words” type of narration will not satisfy them. They will be ready then to bring their developing rational powers into play. They may begin to analyze characters, make comparisons and contrasts, or reflect upon the worldview of the author. Narration becomes more than “telling back,” and deepens into the most advanced kind of thinking and writing. By the time a child reaches this point, he has probably begun to do at least some of his narrations in writing. Narration can be focused upon just one aspect of a story. Rather than retelling an entire chapter, you may ask your child to compare two characters, or relate the causes of events. Rather than fretting about “how to write a paragraph,” a child with a deep background of narration will plunge into such assignments with the ability to marshal his thoughts and lay them out in some kind of rational order. This does not mean that every child will be a wonderful writer–such are rare in this world–but it does mean that he will be able to put his thoughts on paper in a meaningful way. Specific instruction about types of writing or writing styles at this point will provide him with new means of communicating. A child who has “grown up” with narration may welcome the opportunity to narrate in these new ways. Let him write a poem, a letter to the editor, a play based on a scene in a book. Narration becomes the springboard for every kind of writing that we might want our children to do. The years of oral practice, plus a couple of years devoted to the transition to written narrations, provide a foundation for advanced composition skills that no structured writing curriculum can hope to rival. Look again at the technique of narration. Those early years of simple “telling back” are laying a strong foundation for writing skills, which will follow naturally. You may remember that narration of events, stories, and history was part of the early rhetorical training for the Greeks and Romans. 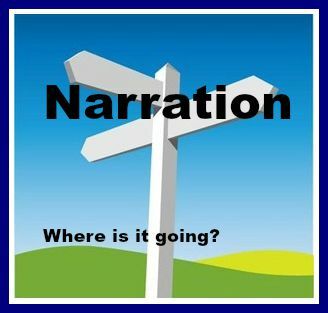 This practice of daily, consistent narration will be easier to maintain if you have some idea of “where it is going.” Narration is the high road to excellent composition. Children who learn to manipulate words orally to express ideas will someday be able to put those ideas on paper fluently. Your children are not “just narrating”–they are becoming writers.